Copy Paste is probably one of those operations that almost every user does on a daily basis. The possibilities are almost endless, copying urls to paste them in emails, copying text to paste it in documents, copying images to paste them in image editors. Basically everything information can be copied and pasted with just a few keys on the keyboard. A quick how to copy and paste: A user can use the CTRL C combination to copy contents and CTRL V to paste the contents of the Windows Clipboard. Copy Paste does have a few weaknesses though. If you copy rich text and paste it into a rich text editor the formatting will remain. The problem can be frustrating if the formatting has been used extensively and should not appear in the destination form. Lots of bold colored text does not look good in a scientific paper usually. 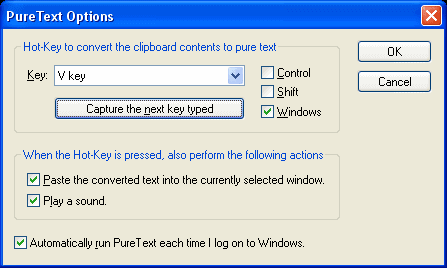 PureText is a small 13 Kilobyte software application for Windows that sits quietly in the Windows System Tray waiting for the user to copy text to the Clipboard. It does not convert the copied contents automatically but provides that option when pasting the contents of the Windows Clipboard. Instead of pressing CTRL C CTRL V to copy paste the contents the user can define an alternative keyboard shortcut to paste the contents of the Clipboard without the formatting. The default keyboard shortcut to paste the contents of the Windows Clipboard without formatting is Windows V but it can be changed to any other key combination with the Windows, Shift or Control key. Users who always want to get rid of the formatting could replace the CTRL V with that one. PureText is compatible to most versions of Windows since Windows 95 up to Windows Vista. The copy paste software program uses roughly 3.5 Megabytes of computer memory.